In Zing!, Gorji calls his cuisine New Mediterranean. That fails to capture the unique and beguiling way the North Dallas chef blends Middle Eastern with his passion for local Texas ingredients reflected in dishes such as Quail Legs with Pomegranates or Wild Boar Gnocchi Gorgonzola and Tomato. Gorji also includes the recipe for his Championship Ribeye Steak with Pomegranate Crème that twice earned him the winner’s belt buckle at the Texas Steak Cookoff in Hico. Products from his Gorji Gourmet Foods line figure prominently in recipes — not a bad thing, considering how good they are. (They also carry the Go Texan seal, designating local foods.) Escargot with Pomodoro, Seafood in Puttanesca and even Bolognese sauce rely on his jarred Pomodoro sauce. The Bolognese also sports a secret Middle Eastern ingredient that makes it pop: ground sumac. 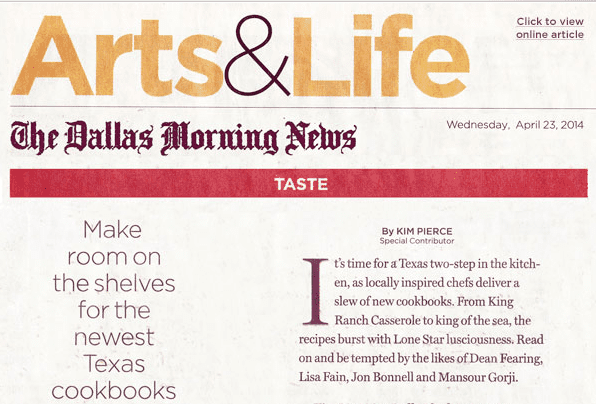 No Replies to "Dallas Morning News—Gorji Cookbook"